Riddleblog - The Latest Post - A Special Election Edition of "Who Said That?" "The long-term goal of Christians in politics should be to gain exclusive control over the franchise. Those who refuse to submit publicly to the eternal sanctions of God by submitting to His Church's public marks of the covenant–baptism and holy communion–must be denied citizenship, just as they were in ancient Israel." OK fellow voters . . . Who said that? Leave your guess in the comments section below. No google searches or cheating. This is a quote from Gary North's book Political Polytheism (1989). This massive two-kingdom confusion is just plain creepy. I'm not sure of dominion theology, but it sounds like a theonomist. Could it be Rushdoony (did I spell it right) or Bahnsen? The quote reminds me of a Presbyterian, who was also a theonomist, that told a pastor that Baptists would be jailed if they did not baptize their infants under a government in accordance with theonomy. Theonomy is weird, in a worrying kind of a way. One of the few benefits (and they really are few) of living in a nation as secularised as the UK is that wacko political philosophy is not terribly popular, despite the endeavours of a few theologians. Rousas Rushdoony, "Scary" Gary North or somebody from that circle. I'm assuming its a modern person because he's talking about Christians taking exclusive control. Early Americans probably wouldn't use that language, that I'm not sure. It's a Reformed person of some stripe because he talks about "covenant baptism". I'm guessing it's Rushdoony because he fit's the first two and uses ancient Israel as the model we are to follow. Speaking of theonomy, anyone ever notice how Rushdoony resembles Saruman the White? So many theonomists, so little time. I'll go with DeMar since he is a local boy (although he moved south). It's gotta be North, surely. The economics language of 'franchise' etc is a dead give-away! Someone from Liberty or Regent University? 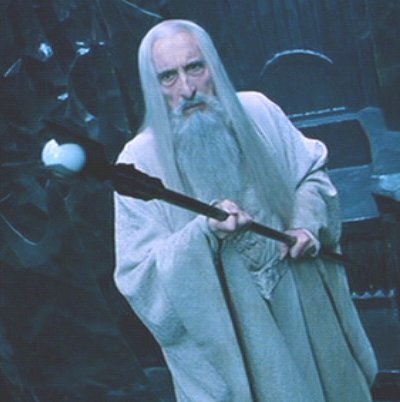 I have noticed that Rushdoony looks a lot like Saruman the White. I also have heard R.C. Sproul compared with Tom Bombadill prancing around in the magical forest. That great literature came from the pen of a deeply committed Roman Catholic- imagine that. It has got to be a Christian Reconstructionist. Perhaps the recovering right wing republican John Lofton. I notice that he sometimes appears on this website- urging B.B. Warfield readers to check out his website. Sorry John, I want nothing to do with your brand of beat em up Christianity. I do have a bit of the boxer in me but the Reconstructionists get to be extremely obnoxious and embarrassing. They try to bully people into the kingdom of God. They are functioning under a bad soteriology. The only thing that finally shut them up was the challenge of many leading Protestant theologians who began to write books against them. You do not hear much from them anymore- especially after Rushdoony died.